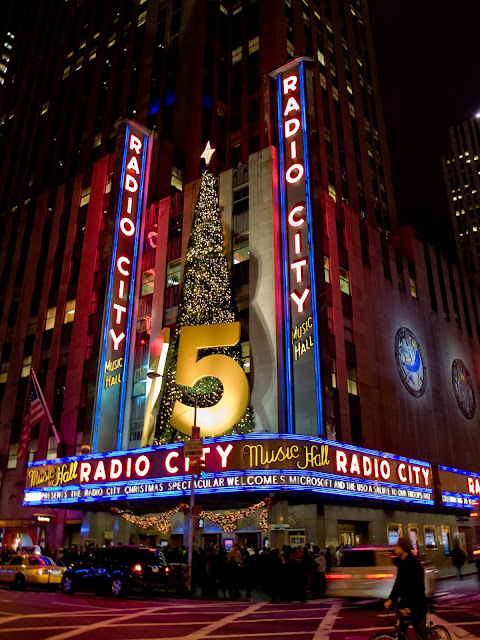 I remember the time my father took me to New York to get my new eye and afterwards, as a treat, he took me to see the Rockettes at Radio City Music Hall. 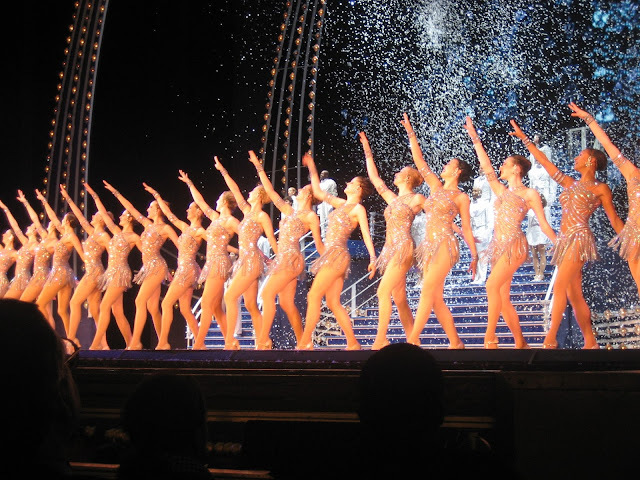 I didn’t even know who the Rockettes were, but my father seemed very excited, so I was, too. As he bought our tickets, he looked down at me with that really good smile of his that made lots of little lines shoot out next to his eyes. He was so handsome in his winter coat, and even though I was tall for my age, I still had to look up to him. He held my arm as we worked our way into the gorgeousness of the theater and found our seats in all the rows and rows of them. They were probably, in fact most certainly were, velvet! The ceilings were the tallest I had ever seen, with rounded pillars, although I didn’t know that was their name then. I was just glad to be with my nice, funny Daddy, who was in such a good mood. I was probably eight or nine. We had made that New York trip several times before, once a year anyway, since I’d had the cancer that made the doctors have to take out my eye when I was not yet five. It was years and years until I knew what it was called and I usually forgot the name, just knew that it had blastoma at the bottom of the word. Blastoma sounded to me like a cartoon character, something fat and kind of dumb. That day, in the morning, when we got to the eye place, I gazed around at the other people waiting on the hard chairs. It was a tiny office, very far up on a high floor in New York City building. If you went over to the windows to look down it made a little flibberty feeling happen in your stomach. Well, it happened in my stomach, anyway, so I only did it the one time. The office was dark and not at all pretty. No colors that I liked a single bit. There were usually about seven or eight other people waiting there with us. Old people, no kids like me. My secret mission was to see if you could tell which people had eyes that didn’t match that meant one of them had a glass eye like mine. I always won the game but I didn’t like winning. When it was my turn, my father went in with me and we both sat down on better chairs. The man, the doctor-like person, would try out a few little glass shells to see how they’d fit. Nothing hurt; the hurty part was long past and it had happened just before I had the operation and I even forgot about it. I only had a little memory of yelling really hard in the Dr.’s office that one time. But on this day, it was just getting a proper fit and then painting the eyeball on in my own eye color to match my real one that rolled around on its own. It wasn’t bad at all and my father was so nice and funny to me. And then, this day, after I’d gotten my new eye, he gave me the present of going to see the Rockettes. By this time in my life I had already seen my first movie. It had been in Technicolor and it had beautiful ladies in long gowns waving fans at their faces to keep them cool. There were musical numbers with ladies swirling around and dancing, their long, fluffy skirts flying out in all their different colors and I’d never seen anything more wonderful in my life. But this day I was in a huge theater, much bigger and grander than my little theater in New Haven, where I’d been to see that gorgeous movie, and I was going to see real dancers perform on a stage! The place was filled; every single seat had someone in it, mostly bundled up in dark old winter coats, with some ladies in perky hats and some in the knit kinds, like we wore to school. I had to turn around and look at every single person. Then someone turned off the lights where we all were sitting and shined a huge light on the stage. Music started playing, lots of music, loud and strong, not like the small kind that came out of our radio—this was really big! And suddenly, out of both sides of the stage came two long rows of pretty girls, all moving their legs and arms exactly, exactly the same way as each other, tapping and gliding and kicking really high and grinning and I was positively in heaven! They formed a long line across the whole stage—there were so many of them—and kept on doing everything the same! They’d go back and forth and curve around, always with those big smiles, bright red lipstick smiles around shiny white teeth that I could see really well all the way from my seat! And I could see it all beautifully, even though I had only one eye! I couldn’t get over it! I probably squealed! I would have, knowing me. My father was grinning, too, and I could see that we were having the time of our lives! Nothing ever compared to what we were doing—not the roller coaster at Savin Rock or even Christmas. This was the greatest thing in my life! Years later, people would mention that I must have a huge lack of depth perception, since they’d tried cupping a hand over one eye to see what it would be like to be me and then walked into a wall. Occasionally, someone would marvel at how I didn't walk into walls myself, but the truth was, I often did. I just got good at doing a quick little turn-y move and made a joke of it. I wasn’t going to be a Rockette---that was out. And I wasn’t all that hot at tennis and badminton either, because the depth perception thing meant that the closer anything came to my head, the harder it was to see where it was. But I could see all the movies and plays and concerts that I wanted, pocket change permitting. I never felt that I missed seeing a single thing! And when the eye biz changed from glass to plastic, I developed a party trick—I could tap a fork on the plastic eye and make everyone go “ewww!” My performance piece. This memory came to me the day after I’d been to see my granddaughter, Natalie, perform with the Trey Anastasio Band at the Fox Paramount in Oakland on Friday night. I was thinking about the pure joy that comes from seeing performed-on-a-stage music and dance and theater, the immediacy of it, the connection between the concert-goer and the performers on the stage. But more than that, I had a glimpse of the utter cooperation that involves the performers, one with the others…how they practice and learn what they will do, play, emote, sing, and their perfect timing, the sharing of the space and air and sound, everything agreed upon in the context so as to present themselves and that song to be the best it could possibly be. Working together, for the common good, is how it appeared to me. And even if someone will think that this is just about “entertainment”, I saw it as a way of looking at life: loving something, practicing to get really good at it, finding others who felt and did the same, and banding together to present it all. That seems to be what the Rockettes were all about, what the band was about: love and practice and becoming very, very good at it all.